For some engineers, 3D printing may be coming on in an unwelcome rush. Pressured by management forces who have read how additive manufacturing (AM) will save the world, reducing a hundred-part assembly into one part, or making super-lightweight parts with only skins over lattices, the engineers are subjecting the 3D-printed components and process to the microscope and, in some cases, have found them wanting. 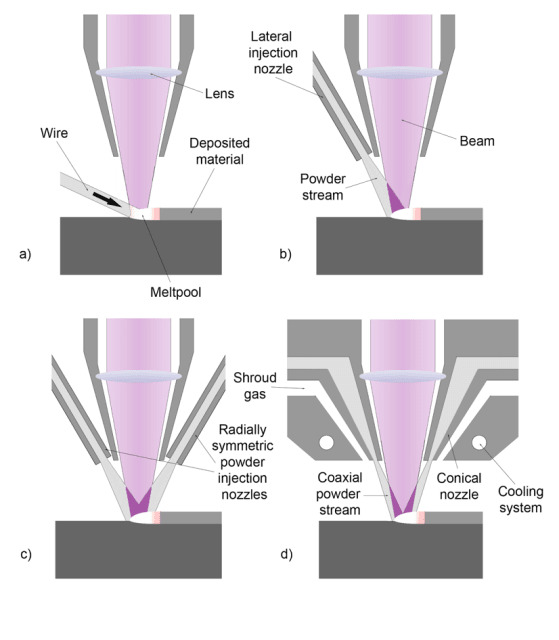 The dominant form of metal 3D printing is powder bed fusion, in which an energy source—a laser in the case of selective laser melting (SLM) or an electron beam in electron beam manufacturing (EBM)—fuses particles of metal powder together point by point, layer by layer until an object is complete. Powder bed fusion systems have mechanisms for controlling the energy source and the distribution of powder. Directed energy deposition (DED) and binder jetting are also used to 3D print metal objects. In the case of the former, powder or a metal wire feedstock is introduced to an energy source. In the case of the latter, a liquid binder is deposited onto a bed of metal powder. After the print is complete, the object is heat treated and sintered in a furnace. In the metal 3D printing process, a number of issues can occur that machine operators attempt to avoid. These include porosity, residual stress, density, warping, cracking and surface finish. 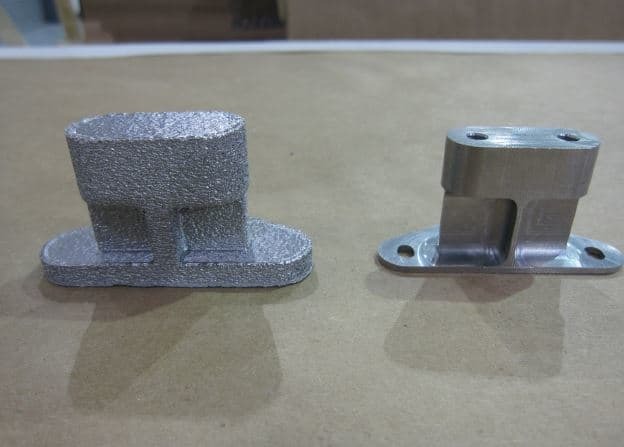 Before a 3D-printed metal part hits the showroom floor or the fuel chamber of an engine, it has already undergone significant post-processing in the form of CNC machining, shot peening or sandblasting. That’s because the metal 3D printing process is a bumpy one when it comes to surface finish. Due to the nature of the process, DED typically produces near-net-shape parts that must be CNC machined to meet specifications upon printing; however, powder bed fusion parts are somewhat closer to their final shape when produced. Nevertheless, the surface finish is still rough. To reduce this, finer particles of powder and finer layer thicknesses can be printed. This, however, drives up the cost of the material. Therefore, there may be a tradeoff between surface finish and cost. Because all powder bed fusion parts will be refined to specification during post-processing, it sometimes makes more economic sense to use slightly larger particle sizes anyway. 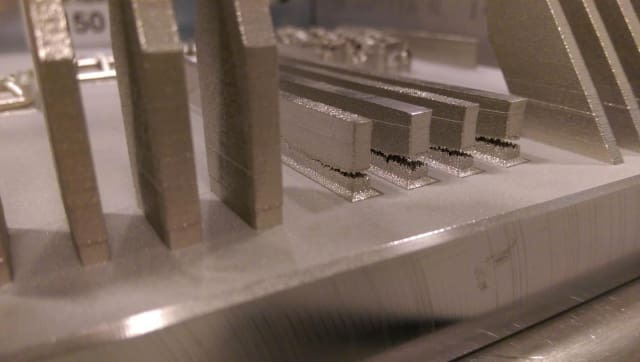 This also means that surface finish is less important than some of the other issues that can occur in metal 3D printing, since the part will undergo some level of post-processing regardless of how smooth or rough the end part is. Porosity occurs when very small cavities form within the body of a part as it is being printed. This can be caused by the 3D printing process itself or even from the powder used in the process. These microscopic holes reduce the overall density of the part and can lead to cracks and fatigue. During the powder atomization process, gas pockets can form within the powder feedstock, which will then be transferred to the final part. For this reason, it’s necessary to purchase materials from a reputable supplier. More often, pores can occur within a part due to the 3D printing process itself. When not enough power has been applied, the laser intensity is too low for example, the metal particles may not fuse adequately. When too much power is used, on the other hand, a phenomenon known as spatter ejection occurs, in which melted metal flies out of the melt pool and into adjacent areas. Pores may also be formed when powder particles are larger than the layer thickness of a part or if the powder is too loosely packed. It can also occur if melted metal does not flow adequately into the desired melt region. To address these problems, most machine operators basically have to tune their machines for a given material and print job. The machine parameters, such as the power, spot size and spot shape of a laser, will be modified for a given material and print job until porosity is minimized. Porosity may also be reduced in power bed fusion processes through the use of an “island scanning” pattern employed by the laser. This checkerboard pattern features alternating unidirectional fills to reduce temperature gradients by distributing the heat. 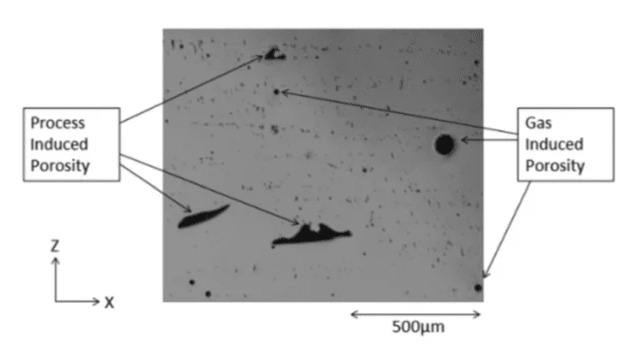 In SLM, the shape of the laser can be modified to reduce spatter ejection. Known as “pulse shaping,” it’s possible to heat the melt area gradually. For EBM, powder particles can be ejected from the powder bed by the electrical charge. This can be reduced by quickly scanning the print bed and the diffuse beam to perform pre-melting of the powder. It may also be possible to infiltrate powder bed fusion parts with another material, such as bronze. However, the use of auxiliary materials will naturally affect the chemistry of the primary metals, potentially disrupting the desired application of the part in the first place. The porosity of a part is inversely related to its density. The more pores a part has, the less dense it is and the more likely it is to experience fatigue or to crack under pressure. For critical applications, a density of above 99 percent is required. In addition to controlling for porosity through the methods mentioned above, particle size distribution may aid in increasing the density of a printed part. Spherical particles will not only improve the flowability of the powder, but can also improve density. Additionally, a wider particle size distribution allows fine particles to fill spaces between larger particles, resulting in higher density. Unfortunately, this may decrease the flowability of the powder. Flowability is necessary to ensure an even, densely packed layer of powder, which, as you might guess, affects both the porosity and density of a 3D-printed part. The more tightly packed a layer is, the denser and less porous the final object will be. Jack Beuth, a professor in the department of mechanical engineering and the director of the CMU NextManufacturing Center at Carnegie Mellon University, was able to shed light on the advances being made in defining the parameters associated with porosity and density in metal 3D-printed parts. Residual stress is a result of heating and cooling, expansion and contraction, that occurs during the metal 3D printing process. When residual stress exceeds the tensile strength of the printing material or substrate, defects, such as cracking in the part or warpage of the substrate, can occur. Residual stress is in its highest concentration at the interface between the printed part and the substrate onto which it adheres. The stress is more compressive at the center of the build and tensile at the edge of the build. Support structures are implemented to reduce some of the residual stress because they will have a higher temperature than the substrate alone. Once the part is removed, the residual stress is relieved, but the part may become deformed in the process. Lawrence Livermore National Laboratory researchers have shown that one method for reducing residual stress is by decreasing the laser scan vector length, instead of relying on a continuous laser scan, in order to regulate fluctuations in temperature. Rotating the laser scan vector in relation to the largest section of the part may also help. Another method for reducing residual stress is through the heat treatment of the substrate and heating the material before it is hit by the energy source. Due to a lower operating temperature, preheating the substrate is more often possible with EBM than it is with SLM or DED. In addition to springing from pores within a part, cracking may occur when the melted metal solidifies or during further heating of an area. If the energy source is too strong, stress may occur during the solidification process. Delamination may also occur, leading to cracks between layers. This may happen as a result of the powder not melting sufficiently or layers below the melt pool remelting. Some cracks may be repaired through post-processing, but delamination is not one of them. Instead, substrate heating may be implemented to reduce this issue. Beuth was also able to speak to how cracking may occur in metal 3D printing. He pointed out that cracking and its effect on part performance are not limited to AM, but are concerns in traditional casting and other metals processing methods. To ensure that a print job begins properly, the initial layers of a print are fused with a substrate that must be removed via CNC machining after the print is complete. However, if the thermal stress of the substrate exceeds the strength of the substrate material, the substrate will begin to warp, ultimately causing the part itself to warp and potentially causing the powder recoater to collide with the part. Therefore, in order to prevent warpage, it’s necessary to place the ideal number of support structures in the right locations. This can be difficult to determine without performing trial and error with each new geometry that gets printed. There are software solutions in development, such as print preview–style software created by 3DSIM. Other distortions, such as swelling or melt balling, can occur during the metal 3D printing process as well. Swelling takes place when the solidified metal rises over the powder. Similarly, melt balls are created when the material solidifies into a spherical shape instead of solid layers. This is caused by issues related to surface tension connected to the melt pool and may be mitigated by controlling the length-to-diameter ratio of the melt pool to less than 2 to 1. Exposure to oxygen and humidity can cause metal alloys to change composition. For instance, as oxygen increases in Ti-6Al-4V titanium, the aluminum content may decrease. This is particularly true when metal powder is recycled. Recycling also causes powder particles to become less spherical and to flow less well. The printing process may also see changes in the composition of metal alloys as well. In a metal alloy, in which multiple metals are combined (i.e., alloyed), the metal with the lower melting point could potentially evaporate in the process. 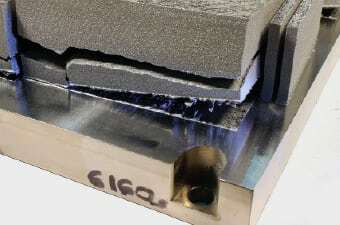 In the case of Ti-6Al-4V, a popular metal for 3D printing in aerospace, titanium has a much higher melting temperature than aluminum, and it’s possible to alter the composition of the material during the 3D printing process. As one might guess from reading this, avoiding issues in metal AM still requires a lot of process knowledge and trial and error. Every geometry alters the variables of the machine, often forcing machine operators to print the same part several times in order to finally overcome issues such as warpage, cracking and porosity. Once successfully complete, the components have to be tested to ensure they meet the proper standards. As may also be clear from reading this, the industry is building up knowledge regarding each metal 3D printing process. Businesses who have nailed down their systems’ processing parameters may not be the first to explain exactly what they did to achieve successful outcomes. One option to access some of this expertise is to join a trade organization, such as America Makes, in which industrial members share data with one another as they research new technologies and define processes. Outside of such organizations are research institutions that are publishing data publicly. Also, among the first movers in the industrial AM space are software companies, such as Materialise and 3DSIM, who are developing software solutions to address metal 3D printing issues. For now, the wild frontier of metal 3D printing remains untamed. The landscape will be very different in the next five years. As Beuth said, “One of the predictions made by our NextManufacturing Center is that within five years, the ability to define these processing windows to eliminate porosity effectively will be a widespread industry practice.” When that happens, not only will individual industry players be able to capitalize on the knowledge gained from metal 3D printing, but the industry itself will as a whole.